You need to have your installation media. For Windows 7, that means you have your original installation DVD or a copy of it somewhere. The Windows version that you're running needs to be no newer than that on the installation media. 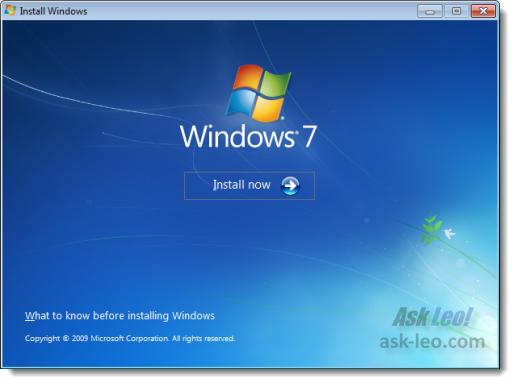 If you installed Windows 7 SP1, then you'll need installation media with SP1 already in place. Sorry. If your machine meets all those criteria, you're good to go. Running setup is a pretty invasive operation - it touches and changes a lot of things. In other words, a lot of things could go wrong. I strongly suggest before beginning this process that you take an image backup of your machine. In case something does go wrong, you'll always have that to revert to. If you insert the installation DVD, the setup program may run automatically. 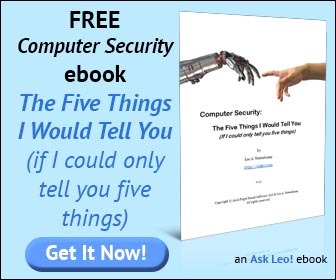 If not, look for setup.exe in the root folder of the media or wherever you have a copy of that. This is the trick to our repair reinstall. A 'repair' is nothing more than an upgrade of the current version to the same version. Windows Setup goes through all of the same motions as any other upgrade, installing Windows, even though it's the same version. In other words: to repair, choose Upgrade. Setup will proceed with its normal processes and could potentially take a while. Hopefully, the net result when it's all done is a repaired system. 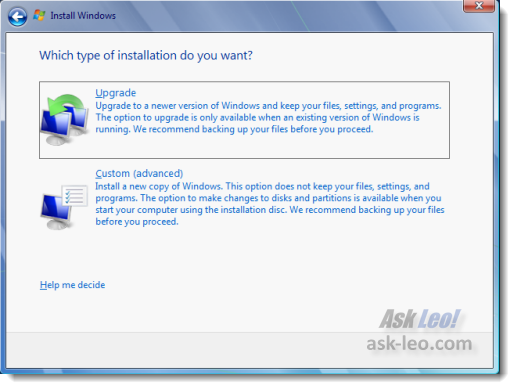 Because this is Windows Setup that we're talking about, it's important to note that, in the process, there's no guarantee that some of your customizations or other changes to Windows made prior to the repair will still be there after. Part of "repairing" is, in fact, resetting and restoring many of Windows internal settings to their defaults. If that impacts some of the changes that you've made, you'll need to re-make those changes or elect to live without them. 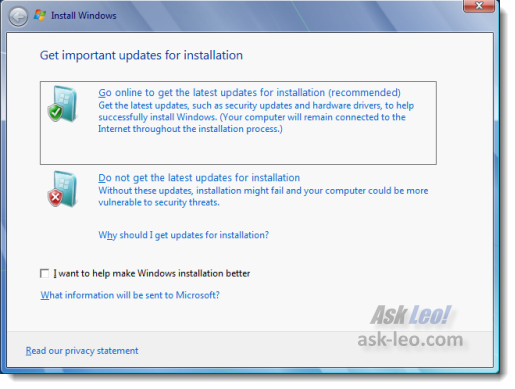 How should I reinstall Windows? There are different ways to reinstall Windows. Which is appropriate depends on the problem you're attempting to solve. Of course, one of the reasons to run the repair install is to fix a non-booting system. Windows 7 install media does have a "fix startup problems" choice (you might have to press F8 during startup to get to that menu), which might help in those cases. Unfortunately, I've often seen non-booting systems say "no startup issues found" when using this option. What's most frustrating is that repair path on the installation media that includes a couple of nice repair tools like "fix startup problems" (another article for another day), doesn't let you simply do the repair install that XP used to. It'd be so valuable if they did. Leo, with Windows 7, it encourages you to create a 'repair disk' (which I have done), though I don't have any original media. Are you able (another article maybe?) to comment on the value of this in these circumstances? Thanks. Yes, a repair install option via bootable media would be ideal but don't forget - Windows 7 does include a native feature for creating images, which are then restorable via bootable disc. If it came to a choice, I'd opt for the the image feature all day. Start creating images at regular intervals people and you won't need the repair installation option. I agree with Jim. More than once I've solved Windows system problems in 10 minutes by restoring my last image known to be good. I agree with Jim. Restoring backed up images (.iso) have saved me several time, the last being one month ago. I create and save iso images monthly to alternating hard drives. I've tried to repair my windows 7 using my install disc but it tells me the version on my machine is newer than the version on the disc, I cant find SP1 in uninstall programmes so assume that this is on the disc, delete all the installed updates perhaps? ?